Dr. Hejazi treats many adult patients who would like the benefits of a straighter smile, but who shy away from traditional metal orthodontia. With ClearCorrect clear braces, he can provide them with a modern and unobtrusive solution to crooked, unevenly spaced teeth. ClearCorrect offers high quality treatment that is customized to each patient’s unique needs. At your ClearCorrect visit, Dr. Hejazi will take detailed impressions of your teeth. A specialized dental lab will then create a series of custom aligners fabricated specifically for your smile. 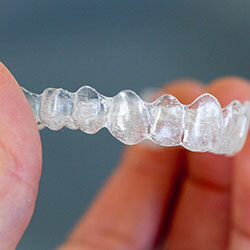 Each pair of aligners will be prescribed for about two weeks, and then you’ll move on to the next set. Dr. Hejazi will periodically evaluate your progress. With ClearCorrect clear braces, treatment times are shorter than traditional metal braces, and typically range from about 6 to 18 months. Your ideal smile could be closer than you ever imagined!